Have you ever deleted photos accidentally from computer, camera, memory card, Android phone or other devices? Never fear, you may actually be able to get those photos back easily. 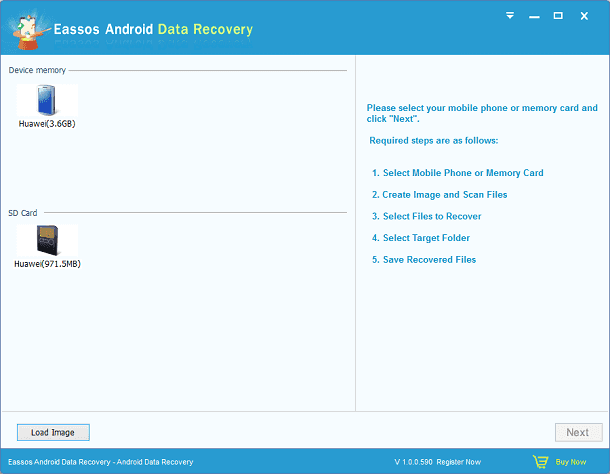 This article will show you how easy it is to recover deleted or lost photos from Android phones as well as memory cards. Photo recovery on Android or memory card is easy and these methods here are worth a shot before hiring recovery services or totally giving up. What you should know about photo recovery? Why deleted photos can be recovered? Before digital photo became popular, we had to take photos with film and developed them to paper photos which would be put in frames, albums, boxes, etc. Thanks to digital camera, the way of photo taking changed. The photography has never been so simple, as it no longer needs photo rolls and related stuff. Everybody can take as many photos as he wants with a digital camera or smartphone and all he needs to do is clicking the button placed on camera or phone. Then we can transfer photos to computer or upload to social networking sites such as Facebook, Instagram, Pinterest, etc. We've been benefiting from photos which help us record important moment we want to keep. We are free to take as many photos we want without being bothered by the capacity or size of reel. The way of capturing and storing photos is really great and can be regarded as perfect except one thing. Since photos are digital data stored on data storage devices, it's equally easy to delete any photos we just take. This issue happens to anyone of us, and many have experienced the problem. Operating system tries to prevent you from deleting files by mistake and it provides Recycle Bin from which you can restore files as long as they haven't been further deleted from Recycle Bin. However, this function doesn't work for USB drives such as USB flash drive, memory cards, digital camera, etc. Fortunately, there is another easy solution to get back deleted or lost photos and pictures. You might be wondering how it is possible to retrieve photos which you have already deleted. We'd give you a quick explanation. Your digital camera or cell phone contains a memory card that provides space to store photos. When a photo is taken, it'll be stored on the memory card and managed by file system. Recovering deleted or lost digital photos is possible and most of time easy to achieve. That's because storage devices do not immediately wipe photos after deletion. In fact, the deleted image is only removed from file system instead of the memory card. They will be tagged as deleted so that previously occupied space on the card now will be available to save new photos taken by users. Basically, deleted photos are still there on the memory card until they are replaced by newly stored data. During that time, recovering lost photos from memory card is possible. Other storage devices like USB flash drive, SD card, TF card, HDD employs same theory, and retrieve lost data from these devices are possible as well. The most common photo loss issue appears when you delete files and then delete them from Recycle Bin. Many times, emptying Recycle Bin is done with the purpose of freeing up disk space, but many users lose files by accident this way. We often hear about complaint that people delete an important folder by mistake without realizing its importance. Besides, files can be deleted by malware or virus without known by photo owners. The actual data loss won't occur before deleted files are cleared from Recycle Bin, but USB drive doesn't have a Recycle Bin for user to restore data. Thus once photos got lost from memory card, the only thing you can do is starting recovery. Another data loss cause is file system corruption. File system is responsible for data management and it won't be able to access photos if it is corrupted. Symptom of this problem is familiar to users, for instance, disk become inaccessible and reports error "The file or directory is corrupted and unreadable." What's worse, some users choose to format the inaccessible drive, making it difficult to recover data successfully. The first thing you should do if you want to get back all deleted photos is stopping saving files to the storage devices, for example, do not take pictures after deletion. As mentioned, deleted photos are still there on the device before the free space gets reused. If you continue using it you may not be able to recover lost data as they might have been overwritten. File overwritten can be a matter of time, because memory cards are usually small in capacity compared with HDD and free space will soon be used up if you take new photos or storing new stuff. What's more, system writes data randomly to drive, which means any data writing in will overwrite lost data. If you are serious about lost photos you must act quickly and try to protect the device from being written by new data. Therefore, turn off digital camera and remove memory card from it, stop using cellphone if it is suffering from file loss and then attach it to computer to start photo recovery. Next step is to locate efficient recovery software to do the recovery job. The software should be fast, reliable and effective. Actually, there is no need to considering expensive data recovery service, for recovery freeware can do the same thing even though you are not proficient in computer skills. You do not have to be a computer geek or specialist to restore lost images. You can fulfill the task without any difficulty as long as you use correct software. Recovery software shouldn't be installed to the drive that needs recovering data, as this can overwrite lost photos you are trying to rescue. If lost photos were stored on USB drive like SD card or thumb drive, you can install software to computer HDD and scan external disks which have been connected to your PC. When lost imaged are found out, you need to save photos to a different disk and complete recovery task. When you search for data recovery software on Google you'll see many recovery programs available online, but that doesn't mean all of them are qualified to help you recover data. If you feel at sea with your search result, you can follow criterions below to choose the most appropriate recovery software. It is wrongly assumed that recovering photos is easier than recovering other types of data. But actually, the success rate largely depends on data loss causes and file overwrite condition. The best photo recovery software should be powerful enough to recover data from various data loss situations and storage devices. Losing important photos is extremely stressful and frustrating, thus do not make the day more difficult by using photo recovery software which is complex to use. The software should guide you through every step of the recovery process, so that beginners can learn to use it within the shortest possible time. The data recovery software should come with a concise recovery wizard including the installation and recovery steps. Scan and recover button should be clearly defined and placed. And the mouse clicks or other operations done by users should be as few as possible. It has no learning barriers even for a user who doesn't have many computer skills. An excellent photo recovery program should balance performance and usability. Fast speed helps you recover data with shorter time. Although scan speed is not necessarily linked with recovery success rates, improved scan process means that you'll see your photos sooner. Some recovery programs displays data after scanning completes and users can only see the progress bar during scanning; while some software is able to list lost files it just finds out when it is searching. In addition, you are allowed to preview photos during scanning. While choosing any product, you should always put customer support into consideration. Make sure you'll able to contact support team of the software developer and get satisfying help when you are in trouble. Besides, you should check its website whether user manual or educational resources are available. It support recovery of all common picture file types and vector images, for example, JPG, PNG, TIF, BMP, GIF, SVG, DWF, DWG, ICO, ANI and more. It recognizes nearly all camera raw images such as Nikon, Canon, Fuji, Sony, Panasonic, etc. as well as production images including Adobe Photoshop, Illustrator, Corel Draw and Corel Paint. It is compatible with a wide range of storage devices: HDD, SSD, USB flash drive, CF card, SD card, memory stick, etc. Apart from recovering photos, it's able to recover other sophisticated data, for instance, document, video, music, emails and the like. First and foremost, you need to connect the memory card to computer via a card reader. If you do not have a card reader, you can insert the memory card to your digital camera or cellphone, and plug camera or cellphone to computer using USB cable. Once your card is recognized by computer, the photo recovery can begin. 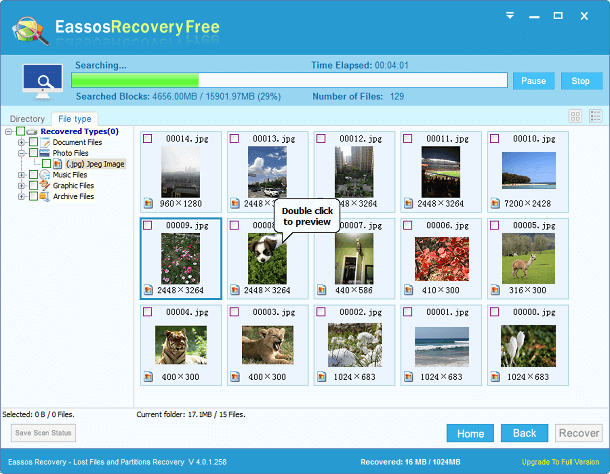 Please download Eassos Recovery Free and you can follow the detailed guide to recover your lost photos from memory card. Install the software to your computer. Double click the installer and you'll see a wizard-based interface guiding you through the installation. Please make sure when you are installing it, DO NOT install it to the memory card where you want to recover data. 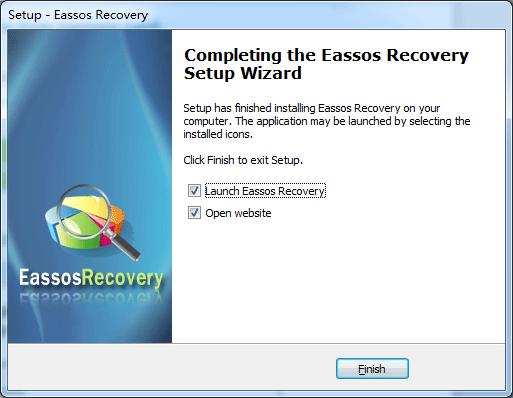 Launch Eassos Recovery Free after it is installed. 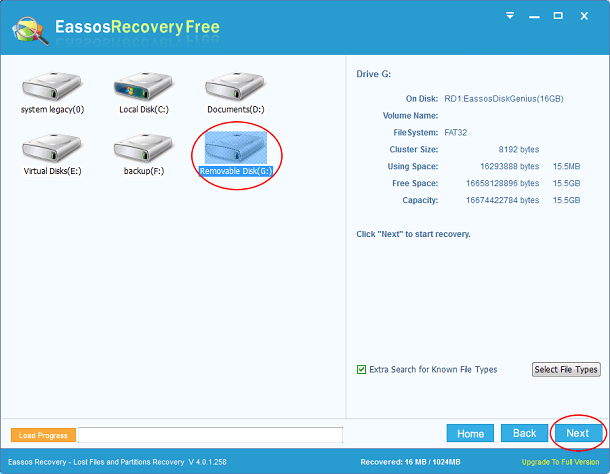 There are 4 recovery modules on the wizard and choose "Recover Delete Files" which is the correct feature to get back deleted files. Select the drive that represents the memory card and click "Next" to start scanning for deleted photos. If you want to do a deep scan, you can select the option "Extra Search for Known File Types". It's recommended to select it, as it helps to find more files that you may need. 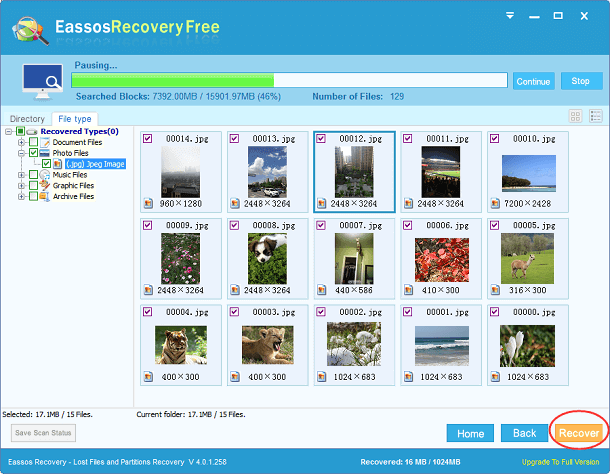 Eassos Recovery is scanning the selected memory card and it has found out many photos. Now you can see photos are displayed in thumbnails and you can double-click anyone to view it in original size. Recover deleted photos. If all photos you want to recover have been found out by Eassos Recovery, you can either pause or stop scanning files and copy files. Select photos and click "Recover" to save them elsewhere on your computer. Note: you can save the scanning progress before you close the software in case of need next time. There is never a guarantee that all lost files can be recovered at any time. We have some tips that can help you prevent data loss. Use reliable memory cards instead of cheap card bought from unknown producers. Do some search first and buy any digital products from local or online shops which are officially authorized. Backup data. If your photos are shot in an important event, you should back up files as soon as possible. Prepare a USB card reader which is able to attach your memory card to computer easily, then you can backup data to your hard drives or cloud drives. Remember to make a second copy for backed-up files and save each copy on separated drives. Change new memory card. If your memory card is frequently used, it is more likely to get issues, such as it becomes inaccessible. You need to invest memory cards and change a new one in time if the old one is going to fail. Install anti-virus software on your computer. Virus or malware deletes and damages files, thus you need to make a full scan for your memory card every time you attach it to computer. Most Android phones provide powerful camera function which is favored greatly by their users. For many Android phone users, losing photos means too much especially when lost photos have not been backed up. However, it's known to all that there are many reasons causing data loss, such as deletion, incorrect operation, phone broken, flashing ROM, restore to factory settings and more. 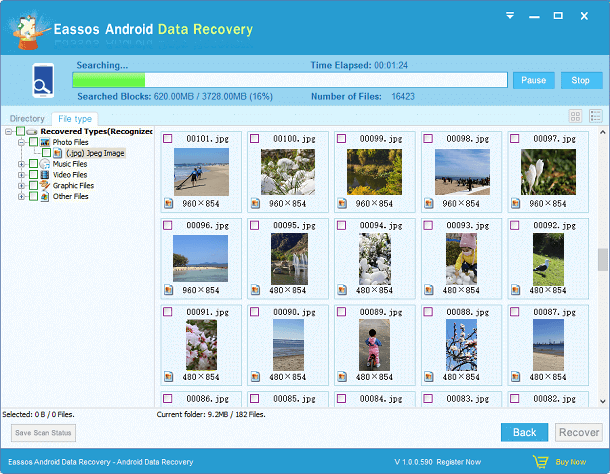 Luckily, we have chance to get lost photos back with the help of Android data recovery software. 1. This process requires root privileges on your phone. 2. Please do not add new data to your phone. Turn off Wi-Fi and data connection in order to keep lost data from being overwritten. If your data was overwritten, what you lost can't be recovered anymore. 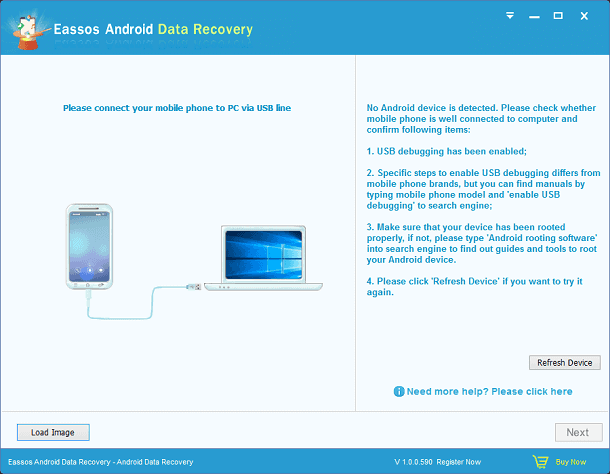 Download Eassos Android Data Recovery to your computer. Install and launch it and you'll see the interface below. Click "Refresh Device" and the software will recognize storages on your phone. Select the storage device where deleted photos were stored and click "Next" button to start scanning. Preview and recover deleted photos. Select photos you want to recover and click "Recover" button to save deleted photos on computer. It takes time to complete scanning based on the size of selected storage device, please wait patiently. Free data recovery software to recover deleted, lost and formatted data from HDD, flash drive, memory cards, etc. How to fix error 0x80004005 step by step? How to fix 0x80070005 error easily? How to fix issues related to error code 0x80070002? How to fix Windows update error code 0x80070490? "hi, do the phone need to be rooted before trying to recover the lost videos? also, can we recover the data if factory reset done." "hi eassos. I recoveried my files (picture, word,etc.) before eight years, from my hard disk that I erased it accidentally. but I have a problem since then. When I rescued these files another rescue program before 8 years, I dont see my pictures, I give a error message about file corrupted. How can I see my files again. Please can you help me? Have a nice day." "External HD can't be opened. Presumption is that this may have happened because HD was unplugged/powered down before internal directory was finished updating itself. Can I recover all data with its directory?" Eassos Reply: Yes, your files are recoverable. You can use either Eassos Recovery or PartitionGuru to scan the disk in question. Then you can see and preview your files. If files can be listed and previewed in the software, you can save them to your computer after software is registered. 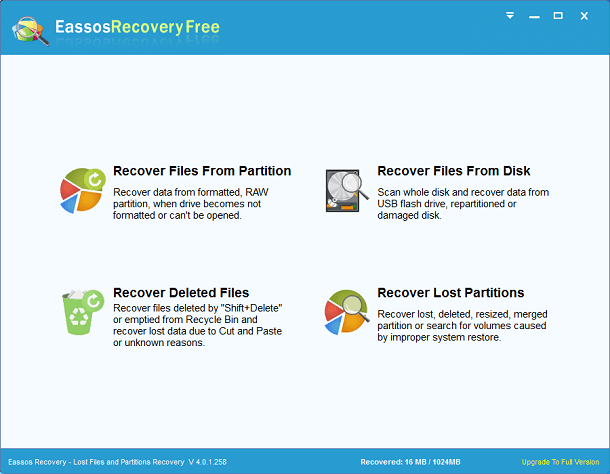 "Just bought Eassos Recovery yesterday and while I was reading through stuff on your website, I noticed you also have PartitionGuru as a product which has the same recovery function as EassosRecovery but also supports resizing partitions and stuff. Can I change license code?" Eassos Reply: Thank you for contacting us. Please send your order ID to our support team: support#eassos.com (replace #with @) and we'll change license code for you. "its really working! SD card turned to RAW, your software saved photos for me. Thanks a million. I tried to format the memory card, but Windows was unable to format it. Do you know how to repair it?" "I am trying to recover files from an external drive, I can only see the folders; I cannot see individuals files. I want to recover the individuals files that are not in folders. Can you assist?" Eassos Reply: Double-click folder can open it and you can view files in this folder. "It is a 1TB external HDD and becomes inaccessible. The message I got was "The parameter is incorrect". Eassos Recovery is able to find out most files while scanning goes to 49%. However, when it finishes scanning and copy files to another disk, I couldn't open recovered files. Could you please help?" Eassos Reply: Can we have a look at the issue and help you fix it via remote assistance? Please tell us when we can start. "About two years ago I bought your software Eassos Recovery. I sold that computer and lost the license key. Can you retrieve it for me? " Eassos Reply: Hi, thank you for contacting us. We've found the license key related to your email address and sent it to you. Please check your inbox. "I want to recovery files using your software but i need to make sure to see if you can find the files, since i purchased other software but didn't recover , so i need to see it before purchase." Eassos Reply: All our software can be tried before purchase. You can use our software to scan the drive which stored lost data. If your files can be found and previewed, then you can recover them with this software. It allows you to preview photos, documents, video & audio files, text files, so that you can make sure whether files are recoverable before purchase. "Dear support, I have an external harddrive that is no longer accessible. Can you help me retrieve photos and documents from that drive?" Eassos Reply: Please do not format the external HDD before files are recovered. Our support team has sent you the setp-by-step guide via email.